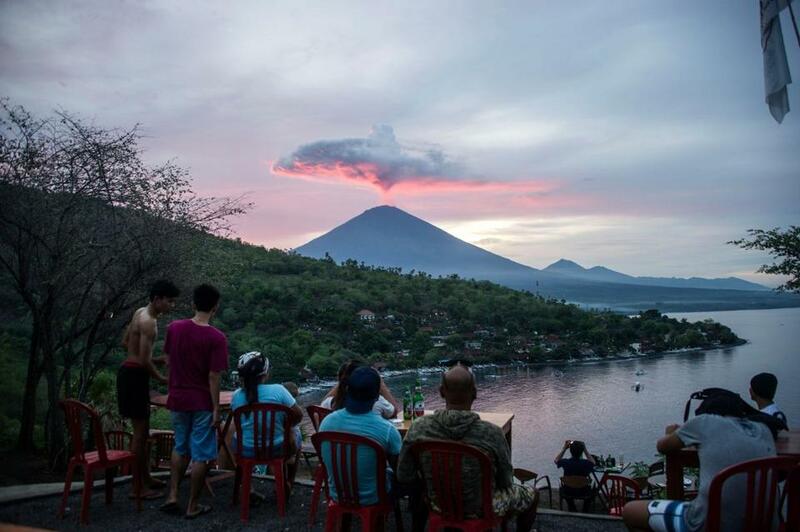 Tourists gathered on Bali to watch Mount Agung’s recent eruption. Could this happen in Western Massachusetts? You’ll have to wait a long while to find out. A massive upwelling of hot rock is rising under part of New England, including Western Massachusetts, raising the possibility of a volcanic eruption, but don’t jump in the car just yet. If it does happen, it will be tens of millions of years from now, new research suggests. The study, by researchers from Rutgers University and Yale University, was published recently online in the journal Geology. “The upwelling we detected is like a hot air balloon, and we infer that something is rising up through the deeper part of our planet under New England,” lead author Vadim Levin, professor in the Department of Earth and Planetary Sciences at Rutgers University-New Brunswick, said recently in a statement. Yellowstone is the site of a supervolcano that has been sleeping for about 640,000 years but could wreak devastation if it erupted. The bubble of rock Levin studied is largely beneath central Vermont, Western New Hampshire, and Western Massachusetts, he said. Levin said the Atlantic edge of North America has not experienced intense geological activity for nearly 200 million years. Levin said in a telephone interview that previous researchers had found warm areas under the surface of the earth on the East Coast.